As European leaders prepare to meet Turkey’s President Erdoğan at the NATO summit this week, CRNI is just one among many human rights orgs urging the Presidents of the European Commission and Council of Europe to ensure that protection of human rights and detention of journalists in Turkey remain a central point of discussion. Last week they spent their two hundredth consecutive day in custody. When the first hearing of their trial takes place, scheduled for July 24th, they will be approaching the end of their ninth month. And their circumstances are far from unique; Amnesty International’s figures indicate that a third of the world’s imprisoned journalists are in Turkey. 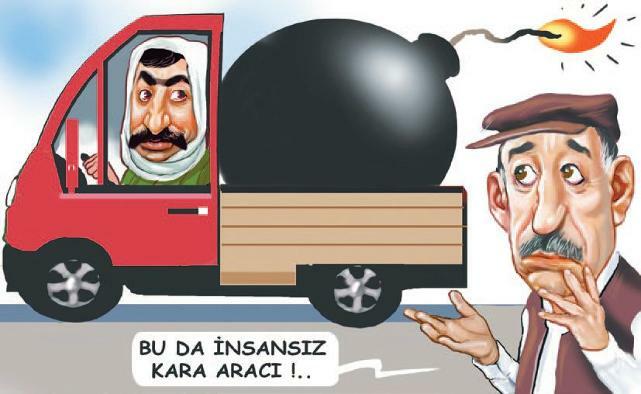 The 200th day has dawned on cartoonist Musa Kart and his colleagues from Cumhuriyet newspaper, jailed and awaiting trial on bogus charges pertaining to terrorism. As Musa faces the possibility of a twenty-nine year custodial sentence, cartoons in solidarity continue to appear on the front page spot he vacated in November last year at the time of his arrest, as above. 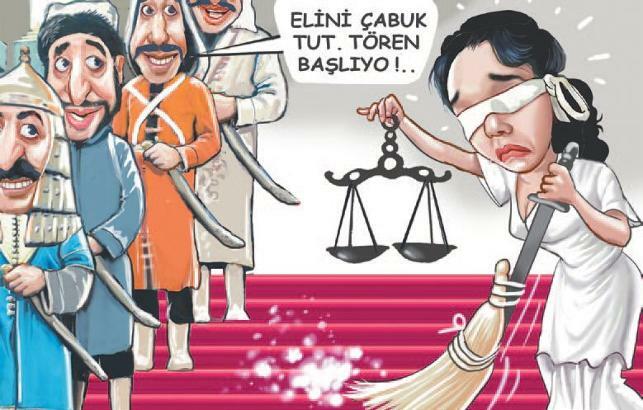 We previously reported on the newspaper’s efforts to lodge a complaint with the European Court of Human Rights, stating that Turkey’s courts have failed to adhere to their own laws and broken international conventions guaranteeing freedom of speech etc. The European Parliament’s Committee on Foreign Affairs met earlier this week with Thorbjørn Jagland, Secretary General of the Council of Europe. The current situation in Turkey was the sole agenda item. Musa and the Cumhuriyet group’s sorry anniversary comes in the same week that Penguen humour magazine ceased publication after fifteen years, a meeting between Erdoğan and President Donald Trump failed to acknowledge human rights violations in Turkey, Erdoğan protestors were beaten on the streets of Washington DC and evidence surfaced of Trump’s private desire to emulate Erdoğan with a crackdown on journalists. 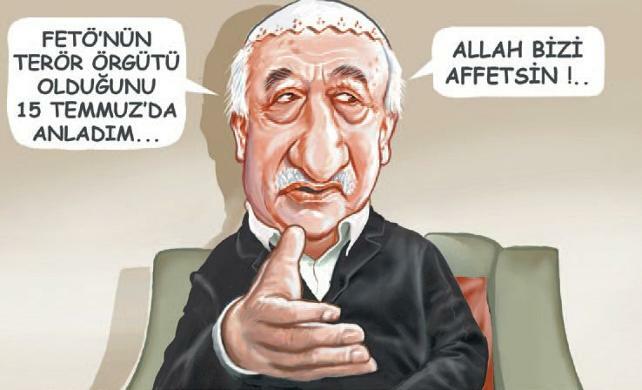 Whether the American president harbours the same enmity for cartoonists as the Turkish remains to be seen. 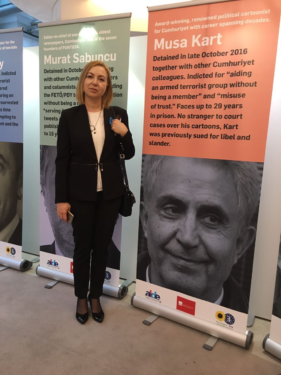 Today Sevinç Kart, wife of imprisoned cartoonist Musa Kart, was in the European Parliament at an event highlighting the desperate situation for press and media workers in Turkey. Her speech is below. Everyday we are waking up to the same day. It has been exactly 184 days today. Our relatives, who devoted their lives to independent and objective journalism, opposed to every terrorism with courage to live in a more democratic country have been jailed with absurd and unreasonable blames and are kept captive and in isolation. 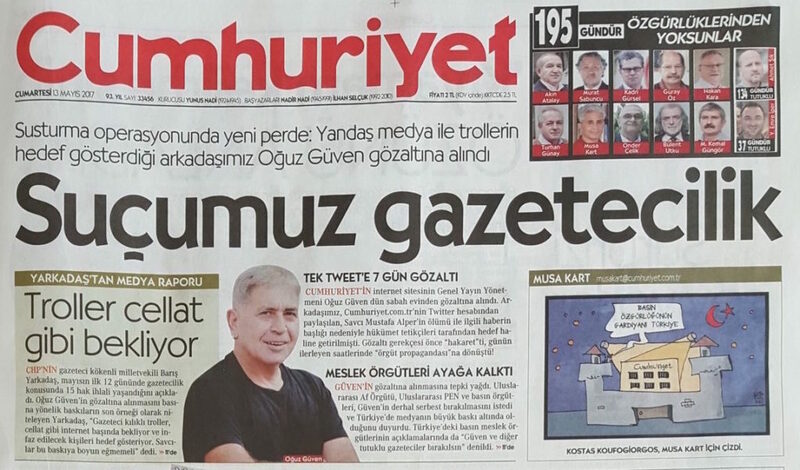 Think of a newspaper that provides transportation every day of the week for one of its jailed journalist’s visitation. Every day, on the upper right hand corner of its first page it displays the photos of its jailed journalists and the number of days they have been away from their freedom, loved ones, and pens. It is not very easy to describe our anger intertwined with sadness. Our children were compelled to mature quickly during this period. As you know, Turkey is going through a very difficult and historic time. 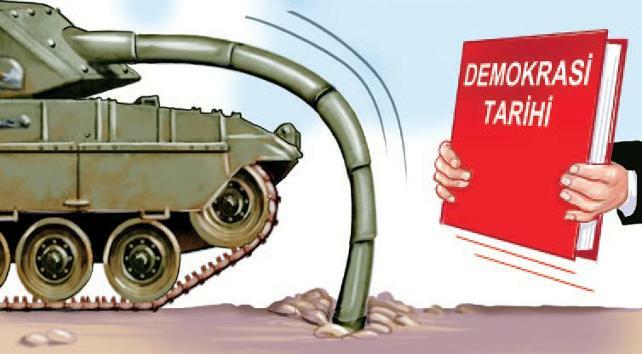 Instead of identifying the people involved in the 15 July 2016 coup attempt, including the political base, with a serious legal investigation, government transformed it into an opposition witch-hunt by declaring state of emergency. 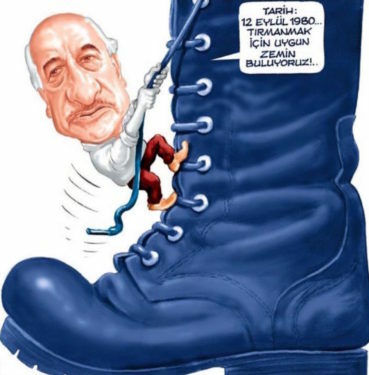 The way my husband described this as “every possible opposition were thrown into a bag that was prepared well in advance” and a political operation was begun to silence the Cumhuriyet newspaper where my husband worked as a cartoonist for many years. Cumhuriyet is an independent and objective newspaper grounded on secular, democratic, and human rights and freedom principles of publishing. It is a voice for people with no voice. That is why it has always suffered from pressures, conspiracies, and imprisonments during its publication history, but never conceded. Tragically funny charges were brought in the indictment which was prepared five and a half month after the writers, artists, and managers of the paper were jailed. It was hard to find any legal concrete evidence. Journalistic activities were linked to terror organizations with fabricated conclusions, objective news was judged as efforts to make the government and the president look bad. If you are not on my side you are a terrorist mentality destroyed the freedom of speech. The message given is: “You can’t publish the news I don’t want. You will pay immensely for your courage and opposition”. In summary, judicial mechanism today became the source of fear instead of justice. 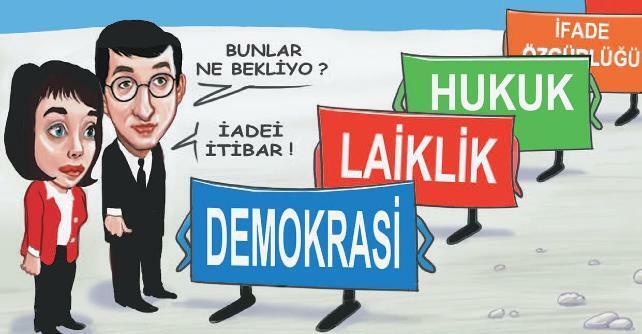 Without a free press and independent-judiciaries it is impossible to have a democratic and judicial state. Independent press is the strength of the democracy. There is a saying that calm waters do not make master sailors. Waters in our country are never calm. As master journalists, they get their strength from the confidence to their work. We are proud of our relatives who perform their profession honestly and with self-respect. As the closest person witnessing Musa’s life, I could say that he performed his work with great enthusiasm and respect. He sketched every antidemocratic application, injustice, unlawfulness witnessed in every political administration without being afraid of and without giving up. In other words, he did what a humor master was supposed to do. But, this administration did not overlook humor and criticism and chose to punish intellectuals like Musa with their own methods. No other times, opposition and independent press encountered such heavy pressure and threat like today. Last Friday was the open visitation day which happens once every two months. My two-and-a half year old granddaughter Deniz visited her grandfather in Silivri Jail. We tried to make hours long waiting at the control gates, in service vehicles, and waiting rooms a hide-and-seek game for Deniz. We were making her laugh by hiding behind the walls we were passing. We mentioned our game to her grandfather. After one hour of visiting time, which went by as if it was one minute, was over they came to take him back. Her grandfather smiled and said “Deniz now they are hiding me”. Supporters of cartoonist Zunar were cheered to hear of a small but significant victory in his ongoing legal battles with the government, ruling political party, judiciary and police force in Malaysia today. He has won financial compensation for damage to personal property during a police raid on his office. As he explains, of more importance than the sum awarded is the message this decision sends to those in the country who continue to suppress freedom of expression. “The government of Malaysia, bound by the court order today has agreed to pay RM18,000 (about USD 4,000) as a compensation for destroying my orginal political cartoon seven years ago. When the police raided my office and arrested me under the Sedition Act on 24th September 2010, they laso confiscated the drawing which depicted PM Najib and his wife Rosmah, along with then newly-published book “Cartoon-O-Phobia”. In November 2014, upon my suit, the Court of Appeal maintained the decision by the High Court in July 2012 which had instructed the police to return the drawing and the books to me. The original drawing was badly damaged when I received it. 1. The confiscation of cartoon artworks under the criminal law the Sedition Act is a gross violation of cartoonist’s rights and freedom of expression. 2. To keep the artwork under the police custody for five years and damaging it is a more serious offence. It is clearly an act of intimidation and lack of respect of the work of art. 3. Today’s decision is not about the quantum, but as a lesson to the police and the Malaysian government that using criminal law arbitrarily to confiscate and destroy cartoon works is unacceptable, and was done in bad faith. It is also a clear proof that my book’s title, “Cartoon-O-Phobia” is a right word to discribe the character of the Malaysian government. 4. I would also like to remind that there are currently more than 40 of my cartoon works still under police custody in Penang since November 2016, which are also being investigated under the Sedition Act. I will take legal action for the police to return them at they are. The has to be responsible for damages, if any. Zunar’s damages relate to the incidents that first brought him to CRNI’s attention and earned him our Courage in Editorial Cartooning Award in 2011. At the end of this week Zunar is due to hear a judge’s decision on his challenge to his on-going travel ban.